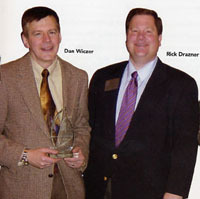 Jan Obrand (In Working order) and Alan Burack (The Claremont Rehab & Living Center) present the Ambassador of the Year Award to Dan Wiczer of WICO Information Technologies, Inc.
Dan Wiczer has been a member of the Chamber since 1996. This past year he has chaired the BG Networkers group which has seen membership grow from 35 to over 50 members during the year. Under his leadership, the group established the Net Advantage, a networking opportunity for members of the business community. Due to it's success, two more have been planned for 2004. Dan also served as an Ambassador and volunteer for both the golf Outing and Buffalo Grove Days Beer Garden. 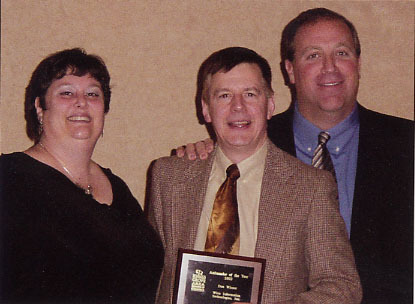 We recognize Dan for his commitment to the chamber and his quest to further networking opportunities of our Chamber. 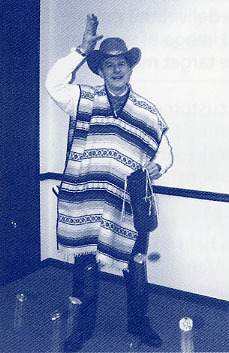 On February 4th Dan Wiczer of WICO Information Technologies presented the first Technology 101 seminar The Intenet- The Good, The Bad and The Ugly. Many subjects were covered including accessing the internet, searching the web, e-mail spam and security. "For a fistful of dollars"!